With only 37 people judged, it wasn’t as busy as the Nashville park from last year’s study, but the Unattractive percentage was almost identical (73% compared to 72% last year). We did not do a Maybe this time. Saturday, July 10th, 6:50pm. 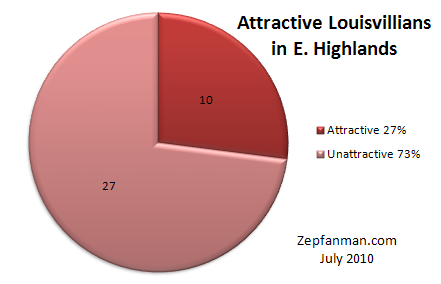 Where do you think would be a better place (in Louisville) and time to find attractive people? For the general public reading this, yes, I agree that this is a shallow exercise, but you know you’d like to do it yourselves, too.